After finishing the above Playsam review, I started looking around which other items Unica Home sells, and I got lucky, because I found my inspiration for the following two features there. Originally, I had planned to write about more traditional wooden toys, but I guess I can always do that tomorrow or the day after. Anyway, here are great wind-up tin-toys by designer Jesco von Puttkamer. They are hand-made in Germany, which makes them one-of-a-kind, as well as high quality products. Jesco’s unusual designs comprise a telephone with moving receiver, a boat, a police car (which I find has more resemblance with a tractor, but never mind), a swiss car and a Red Cross ambulance that can both climb uphill due to their assymetric cross-shaped rear wheel, as well as a set of race cars, which are a bit smaller than the others, but at least they come two per package, turning the lever increases their speed drastically. All tin vehicles are simply beautiful to look at, and were designed with happy memories of childhood and the joy of simple toys in mind. Once wound up with the included key, they run for about two minutes. However, part of their nostalgic charme stems from the fact that these gems do have exposed gears like in the old days, and also the sharp edges make them unsuitable for children, at leat for the small ones. But I am sure many older kids or adults will just love them for their decorative value. Arriving with a numbered and signed instruction leaflet, they are a great collector’s item after all. And surely those parents who buy these precious cars for their children are responsible enough to only let the kids play with them under supervision until they are old enough not to hurt themselves accidentally (at least I hope so). Available at Unica Home , $55.00-$75.00. After a bit of research I managed to discovered Jesco von Puttkamer’s website and thought I should also share some pictures of his studio and some other works. I had never heard of him before, but apparently he must have some reputation, since he has already completed contract work for many big companies, such as Volkswagen and Fuji, and actually began his artistic career recycling leftovers from industrial production, out of which he created large metal sculptures which could be turned, twisted, pulled or otherwise set in motion, making an awful lot of noise. His current focus is on small collectors toys that double as objets d’art and are produced by himself, using the brand name ‘Jetzt Produkte’. You can also order his creations directly from him, with the order form on his website, and he also completes custom orders. But there’s one big catch though: His website is only in German! No wonder why it was so difficult to find it in the first place, and of course apart from the fact that he belongs to a widely extended German noble family whose tradition it is to name their first-born Jesco. Thus you can imagine there are quite a few of them historically, among them is a rocket enginer and senior NASA manager, as well as a governor of German Cameroon, back in the days before World War I, when Germany had joined the European rush to divide Africa among themselves (see Wikipedia). By the way,’von’ means from in German and is a prefix denoting nobility. More precisely, it refers to the city or village under patronage. So Jesco von Puttkamer’s ancestry must be going back to some (probably tiny) place called Puttkamer. Retro racing fun with Darda! I don’t know why these racing sets are not around as much as they used to, or at least I really don’t understand it, they were so much FUN! 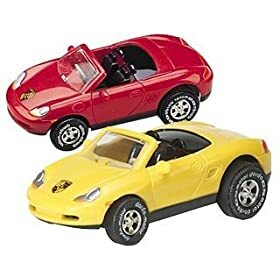 For all those of you who did not play with Darda cars when they were young: These are little wind up cars, about the size of a matchbox car, that run on colorful Darda tracks. What makes this toy so great is that the tracks can be set up in numerous ways, you can always change the layout and it never gets boring. 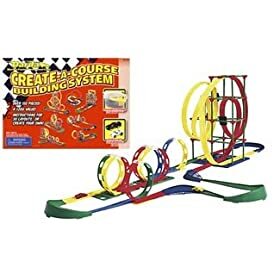 For the ultimate builders, several kits are available, and now we come to the next great feature of this product, you can build loopings and jumps and all sorts of great things. 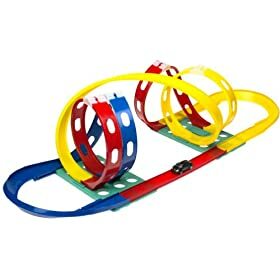 So after you have already had great fun designing and setting up the race track, the real fun starts, because these cars are incredibly fast and it is simply amazing to watch them master looping after looping, and hear the sound they produce when being wound up or when in action. This toy just does not get boring; while younger children will be entertained for a long time just watching their siblings, or using the tracks as set up by their parents (younger kids will need help with this), older children will start experimenting with the tracks, to see how far they can push these little cars, and while doing so discover the boundaries of gravity and centrifugal force! Not only fun, but educational, too! Now that’s a great toy, isn’t it? And yes, these toys don’t run on batteries, another cool feature! 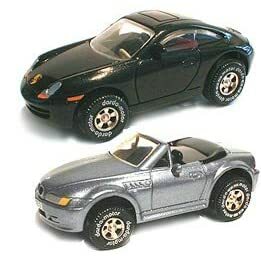 They are also great for lovers of German cars because now your little ones can race their own Porsche or BMW. 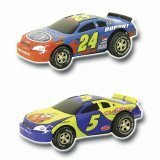 But they also have NASCAR or Formular 1 minitures, and even glow in the dark ones, or bump-n-go cars, which are set in motion when another car crashes into it. More recently, also created the Jay Jay the Plane series for smaller kids. Just beware not to use them on carpet or the engine might get clogged. Available at Amazon, they currently have some nice discounts, too! The biggest collection of Darda products is available at Only Toys. Though their toys are certainly not the cheapest compared to other wooden toys, the combination of great quality and timeless design will surely make them not only a child’s, but also a parent’s favorite, and a treasured heirloom for centuries. Moreover, if you consider the longevity of Playsam toys and the fact that no batteries or electricity is needed, these wooden favorites may actually be less expensive in the long-run than some cheap battery-operated competitors. Well, for the environmental impact, this is true in any case. So now you can have a good conscience and buy some eco-friendly toys without having to compromise style. Now isn’t that invaluable? Available at ScandinavianDesignCenter, starting at € 36,56 for the Streamliner Classic Organic.